Teeth which are decayed, fractured, chipped, discolored or have gaps can be restored using tooth coloured filling materials available which closely replicate the lost tooth part and match the adjacent natural tooth. Commonly referred to as ‘composite resins’ these tooth coloured fillings are chemically bonded to the tooth structure after removal of all decay. It is a meticulous procedure and needs patience since the procedure has various steps to be followed for the final desired result. Composite resin actually strengthens the remaining tooth structure. Composite resin is available in several shades and a skillful and artistic dentist can blend the material in layers onto the lost portion of the tooth mimicking and finally matching the colour and characteristics with that of the remaining natural tooth. The material is durable , resistant to fracture, can withstand chewing stresses and hence, can be used in the back teeth too. 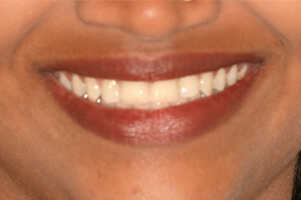 These fillings can be done in a single appointment. Preferred materials for decades, the composite resin materials have been constantly evolving into much better materials in terms of handling, durability and shade match with natural tooth. This treatment modality adapts the most conservative approach to restoring teeth. 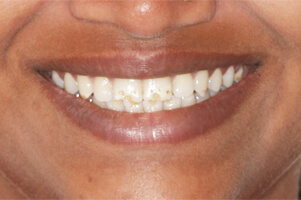 Minor to moderate or even large defects in tooth can be treated by this procedure. Needless to say, high degree of artistry is required to produce amazing results and to restore function.